Peptide sequence is < 50 % identical to other human TLR receptors in this region. , corresponding to amino acids 179-204 of Human TLR2. Our Abpromise guarantee covers the use of ab1655 in the following tested applications. Cooperates with LY96 to mediate the innate immune response to bacterial lipoproteins and other microbial cell wall components. Cooperates with TLR1 to mediate the innate immune response to bacterial lipoproteins or lipopeptides. Acts via MYD88 and TRAF6, leading to NF-kappa-B activation, cytokine secretion and the inflammatory response. May also promote apoptosis in response to lipoproteins. Recognizes mycoplasmal macrophage-activating lipopeptide-2kD (MALP-2), soluble tuberculosis factor (STF), phenol-soluble modulin (PSM) and B.burgdorferi outer surface protein A lipoprotein (OspA-L) cooperatively with TLR6. 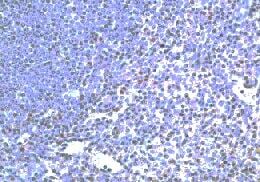 Highly expressed in peripheral blood leukocytes, in particular in monocytes, in bone marrow, lymph node and in spleen. Also detected in lung and in fetal liver. Levels are low in other tissues. Contains 14 LRR (leucine-rich) repeats. Glycosylation of Asn-442 is critical for secretion of the N-terminal ectodomain of TLR2. Immunohistochemistry on human spleen at 1:250 dilution. ab1655 staining TLR2 in murine brain tissue by Immunohistochemistry (Frozen sections). 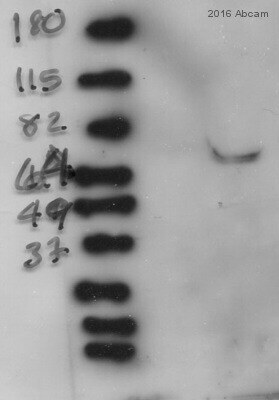 Frozen sections were mounted on glass slides, postfixed in ice-cold acetone, blocked with 1% BSA and 3% normal donkey serum, and incubated with ab1655 at 4°C. A FITC-conjugated secondary antibody was used to detect the primary antibody. 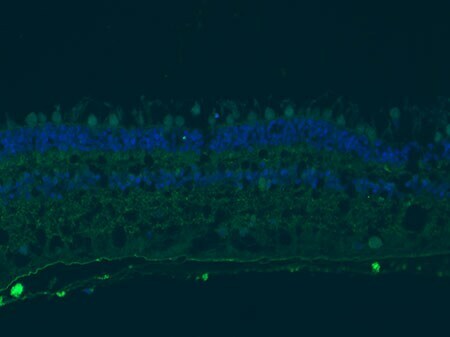 Counterstained with DAPI. Publishing research using ab1655? Please let us know so that we can cite the reference in this datasheet. ab1655 Now, I would like to know if there is a blocking peptide available to this antibody in order to verify the specificity of the staining. If this is not the case, what type of negative control do you recommend? Thank you for your enquiry. Unfortunately we do not sell the blocking peptide for this antiserum. According to the EXPASY protein database (Swiss-Prot) TLR2 is "highly expressed in peripheral blood leukocytes, in particular in monocytes, in bone marrow, lymph node and in spleen. Also detected in lung and in fetal liver. Levels are low in other tissues". Therefore with regards a negative control you could use a cell line where Tlr2 has been silenced through RNAi. Alternatively you may wish to use a cell type other than the aforementioned, that is indicated as having low (if not totally depleted) levels of Tlr2. I hope this information helps, please do not hesitate to contact me should you require further assistance.